The Certificate of Achievement below is 1 of the 3 free certificates. The definition of a certificate is a document testifying to the truth of something. The definition of an achievement is: 1. a thing done successfully, typically by effort, courage or skill, 2. the process or fact of achieving something. 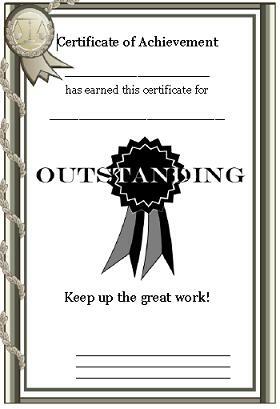 You can also use these achievement certificates at home, school or wherever you want to show appreciation for achievement or goals. You can recognize achievement for your students whenever it happens with these official documents or certificates. Church members and many other people are making very special achievements every day, but not all of them are being recognized for their hard work and accomplishments. It's important to recognize these accomplishments and hard work however you want, but always acknowledge them in some way. These certificates can be printed on white or any other color of resume, stock or plain paper, and can be fitted into a beautiful picture frame to make this gift even more special. They can also be inserted into sheet protectors (purchase from any office supplies store and event WalMart) to keep them looking professional and new. Keep these certificates available on your computer hard drive and be prepared to recognize any of your church members, etc. upon their completion of any achievements that they might so proudly obtain. If your church likes to recognize church members both young and old for all the hard work they do then you may want to download these certificates below. Return to Certificates Page from Certificate of Achievement.